As you may have picked up on, at the moment I'm trying really hard to look after my hair at the moment. Until getting some firm guidance from the Sassoon team last year I was one of those girls who got their hair coloured every 3/4 months and cut once a year. I used whatever shampoo and conditioner was on offer and really didn't think about it any further than that. I certainly would never have spent more than £7/8 on products, and would have thought it irresponsible to do so. As you can probably tell, thats not the case now. I invest in my hair as much as I do in my wardrobe - I'm beginning to get there with skincare and beauty too. One of the first brands I experimented with was Cowshed - I love their candles and their body scrubs as they smell so yummy, so it was a logical step for me as I trust the brand. The guys there kindly sent me over a new updated Horny Cow shampoo and conditioner and I have literally just finished blow drying my hair after using it for the first time. The result? Very good. I smell like one of their salons which can't be bad. I have mid length hair and used two fifty pence sized blobs (is there a better word? teach me the way, I'm still new to this beauty blogging) of the shampoo which was plenty. The conditioner I used half of that, I find less is more with these things. My hair is super, super shiny which I love and feels incredibly clean which is exactly what you want. It's got volume, and its not gone all fly-away which often happens with my hair (I have very fine hair, and lots of it). All in all, it's a luxury hair duo thats worth the money as I feel like I've been to a salon. 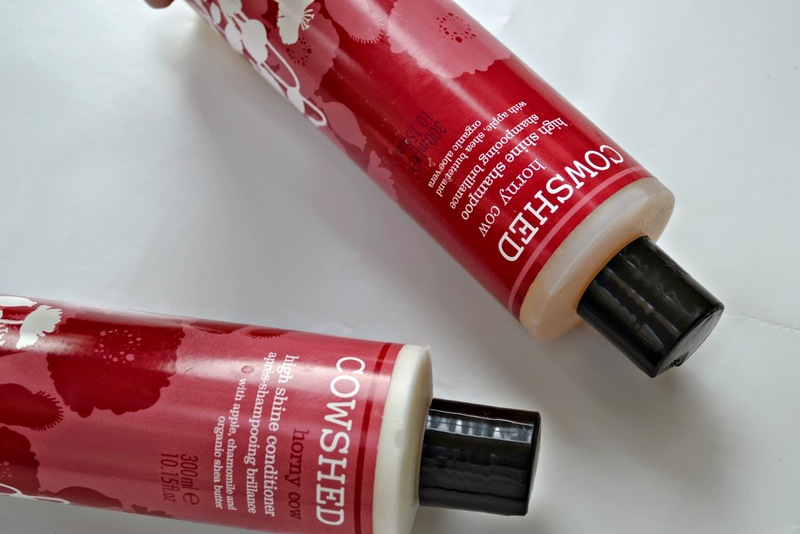 If you haven't used Cowshed or their Horny Cow range before, the scent has cinnamon and rose in it (apparently perfect to seduce, we will wait and see on that one). I'd only ever used their Moody Cow shampoo before in a hotel and found it surprisingly relaxing - packed full of frankincense (which basically stabilises hormones) and was pretty much a detox experience. At £16 per bottle it isn't cheap, but if you pay peanuts you get monkeys in this world - so I'd recommend using it every other hair wash as it would last you months and it really does make a noticeable difference! As usual Cowshed definitely came up trumps with this one... I've already just made a cheeky purchase of their bath oil, just couldn't resist.